Since the 12th century, Italians have been feasting on an addictive amalgamation of flour, eggs, and water, also known as pasta. Though Americans often associate pasta with Italian dishes, such as spaghetti and ravioli, there are, in fact, dozens of cultures around the globe whose staple foods include noodles, many of which are made of rice, buckwheat, potato starch, or kelp in place of flour, in a plethora of shapes and sizes. On this momentous day, then, we thought it only apropos to round up some of our favorite global noodles for a delicious World Pasta Day – each of which you can find right here in the states. Though it looks like its sister noodle, spaghetti, vermicelli is the Asian equivalent, made from rice flour and water (called rice vermicelli) or mung bean starch (known as cellophane noodles). In Vietnam, rice vermicelli finds its way into many signature dishes; it’s in pho (noodle soup), gets tucked into summer rolls, and is the main event in other noodle-based plates, called bún. Surprisingly, you can find all three in Atlanta at chef-owner Guy Wong’s gorgeous French-Vietnamese hotspot Le Fat. 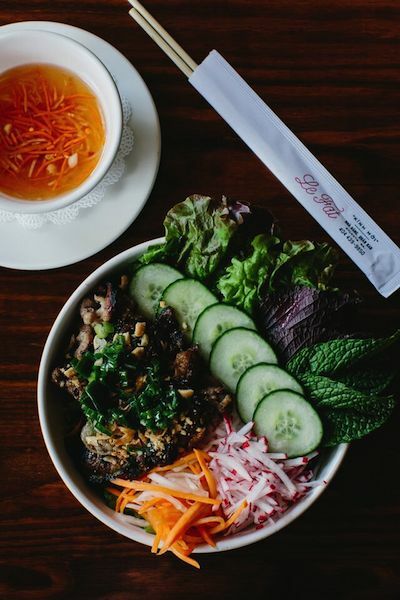 Though the summer rolls are fresh and vibrant and the pho earthy and satisfying, we recommend the bún, in which the rice noodles are topped with an aromatic herb salad, pickled daikon, crushed peanuts, and crispy grilled pork. 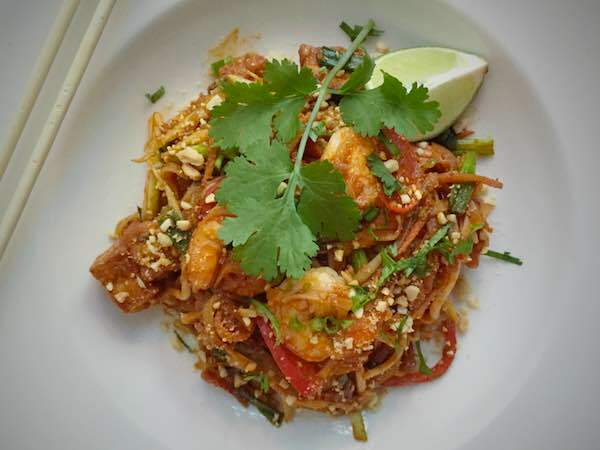 Here in America, there’s perhaps no dish more closely associated with Thailand than Pad Thai, stir-fried rice noodles. Though the dish is often watered down to appease our penchant for sugar, the traditional version is made with soaked dried rice noodles stir-fried with eggs and tofu (or often prawns), topped with roasted peanuts and bathed in a tangy sauce made from tamarind (never ketchup or peanut butter), fish sauce, dried shrimp, chiles, and palm sugar. For the real deal, head to none other than Bida Manda in Raleigh, North Carolina, where chef Van Nolintha serves up a Laotian version of pad thai made with crispy tofu, tomatoes, rice noodles, and plenty of crunchy peanuts and aromatic herbs. In Japan, the name of the pasta game is soba, a thin noodle made from buckwheat flour that’s eaten near daily, whether chilled with a dipping sauce, enjoyed in hot soy-dashi broth as a noodle soup, and even grilled in a stir-fried dish known as yakisoba. 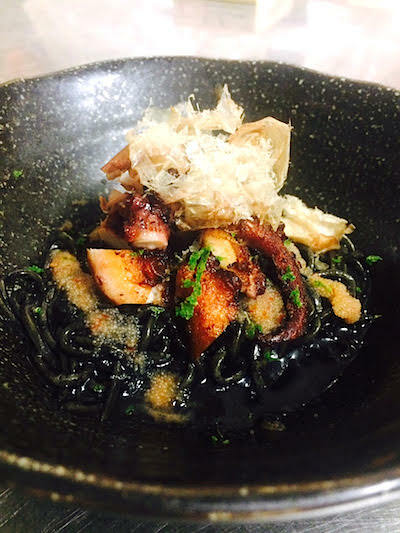 Boston chef Tim Cushman hand-makes two different varieties of soba noodles at his award-winning o ya restaurant — squid ink soba alongside seared octopus and bonito, pictured, (he also serves a chilled squid ink soba dish in an uni consommé) and chilled soba noodles topped with uni, fresh wasabi, and a rich dashi broth. When it comes to stuffed pasta, ravioli gets most of the attention in the U.S., but in the Piedmont region of Italy, it’s all about agnolotti, which is made with small pieces of flattened pasta dough folded over decadent fillings of roasted meat or in-season vegetables. 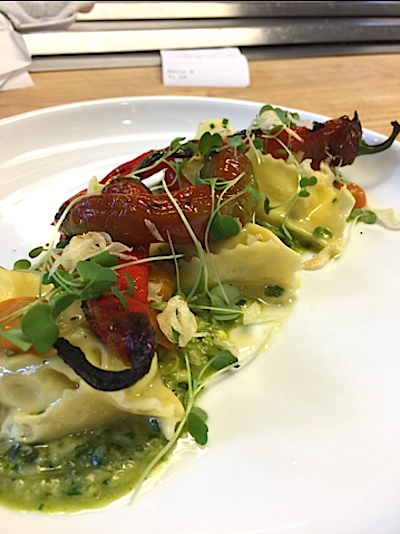 Head to Denver’s eclectic superstar, Acorn, for chef-owner Steven Redzikowski’s handmade agnolotti, filled with summer squash and ricotta and adorned with Jimmy Nardello sweet peppers, pesto corn puree, and heirloom tomatoes. Which noodle is your pick for World Pasta Day? Let us know what type of pasta will grace your plate here or on Facebook, G+, Instagram, Pinterest, or Twitter!